Framing your work in a wooden hoop is an easy and inexpensive way to display embroidery, but there's no reason to leave the hoop looking plain and ordinary. Look through this list of ideas for ways to embellish your embroidery hoops for a fantastic finish! Choose an embellishment option that best suits your embroidery and think about where it will be displayed too. Of course, this is by no means an exhaustive list, so feel free to get creative! 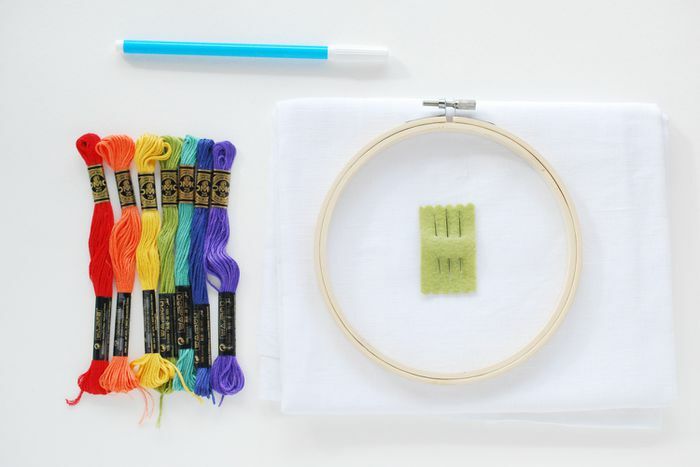 With each of these embellishment methods, you should work your embroidery in a regular hoop, then transfer it to the hoop you'll use for framing. Or, you can add your decor to the same hoop you used for stitching after the embroidery is done. This is one of the easiest ways to make a hoop special. All it takes is a few coats of acrylic paint, and perhaps a coat of sealer. Painted embroidery hoops are also a good base for other types of decorations, so you might start with paint and then add other elements from this list. The least messy way to add glitter to a hoop is to use glitter paint. But there's no need to be afraid of traditional glitter! Fine glitter works best for this. Brush craft glue onto the outer hoop and sprinkle glitter over the wet glue. Be sure to cover the front edge of the hoop. When the glue dries, look at the coverage of the glitter. If it's not as solid as you'd like, add another coat of glue and glitter, and repeat until it looks good. When it's all dry, add a coat of clear sealer to help prevent the glitter from going everywhere. This adds the sparkle of glitter without the mess! Glue individual sequins to the side or front of the hoop, or buy sequin trim. The trim has the sequins joined together so you can glue down a whole line of sparkle with ease! For even more bling, attach plastic gems to the front or sides of the hoop. Similar to wrapping the inner ring of an embroidery hoop for better tension, this embellishment covers the entire outer hoop. Use ribbon or fabric strips that are around 1/2in wide or a little larger. Start near the hardware of the hoop and wrap the ribbon or fabric strips so that each wrap overlaps the previous wrap. Secure the end with a couple stitches on the inside so that it's hidden. Instead of wrapping a ribbon around the hoop to cover the entire outer ring, use craft glue to attach ribbon to the outside of the hoop. Bring the ends together at the top and tie a bow to finish it off. This method is especially cute with decorative ribbons. Crocheted trim is available in different styles and colors. Use craft glue to attach it around the hoop. If you know how to do a bit of crochet, you might try crocheting around the hoop to make a beautiful frame. Another way to wrap a hoop is with yarn, embroidery floss, string or similar materials. And there are a few ways to use those materials. To start, tie the end around the outer hoop and secure it with a knot on the inside of the ring. Then, wrap the hoop! One way to do this is to have each wrap snug up next to the previous one. This will make the hoop fairly solid. Another way is to keep the wrapping loose, but even, or make the wrapping a little more random, perhaps even crisscrossing as you go. You might try changing colors as you wrap or make the knots on the outside so they show and have a bunch of them! To make an extra-special frame for your hoop, make a patchwork piece that attaches to the back with craft glue or a few stitches. A small dresden ring (backed with felt or finished with a turned seam) makes a very pretty embellishment to your embroidery. Cut felt pieces (or purchase pre-cut felt shapes) and glue them around the sides of the hoop or attached to the back so they stick out and form a frame. Circles will make a scalloped frame, squares or diamonds make a nice pointed frame and those are just two examples. You could combine several shapes and have a party around your hoop! Eyelet and other ruffled trims are a great way to embellish a hoop for a baby gift because it adds a sweet touch. Start with a painted hoop and then glue the ruffle along the back edge. 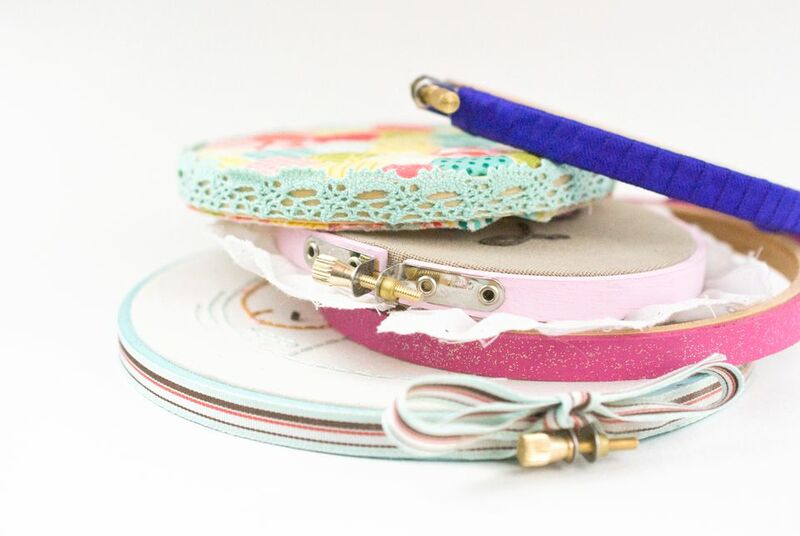 What other materials will you find to add something special to your framing embroidery hoops?